For the last few weeks I have been seeing quite a few golden finches flying around the front yard. For the life of me, I couldn’t figure out why they were suddenly appearing. I haven’t put out bird feeders in quite a while after the squirrel-induced truck burning driveway disaster. I have felt bad about that but the vehicle destruction costs and inconveniences made me not what to entice more squirrels close to the house. I kept an eye out for them and suddenly realized that a number of them were eating the seeds of the coneflowers. These are the very same flower beds where I picked a few to paint. As you can see, they have all pretty much died back. I am sure that there will be plenty of seeds dispersed for next year’s flowers. 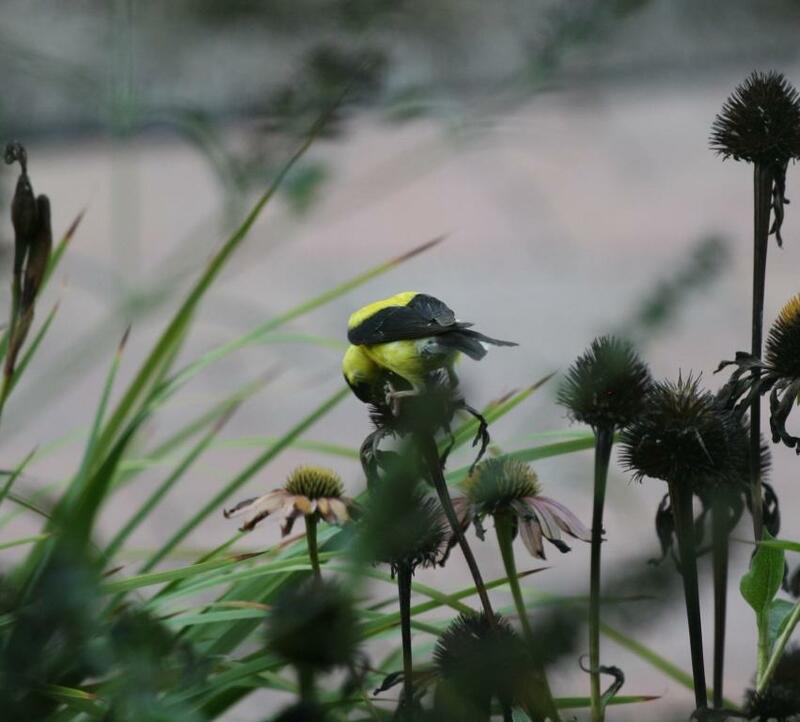 It has been so nice to see the finches right up next to the house. I know the picture could have been a little more attractively done, but it was hard to get a clear shot through all of the plants from inside the house and this was the best of the lot. The other thing I have seen lately is that some of the deer seem to be having an issue with their coats. One time I saw them down at the lake and about half of them looked distinctly grey compared to the normal reddish brown. Some also had white patches. I don’t know what the problem is with the fur, but it isn’t very good looking. And one day the flies must have been biting them pretty seriously. One would be grazing on the shore line or in the water and suddenly jump up and dance around furiously. It was comical at times, but I sympathize with the discomfort. I have a photo of them but wordpress isn’t letting me post it correctly. When I get it fixed, I will add it. 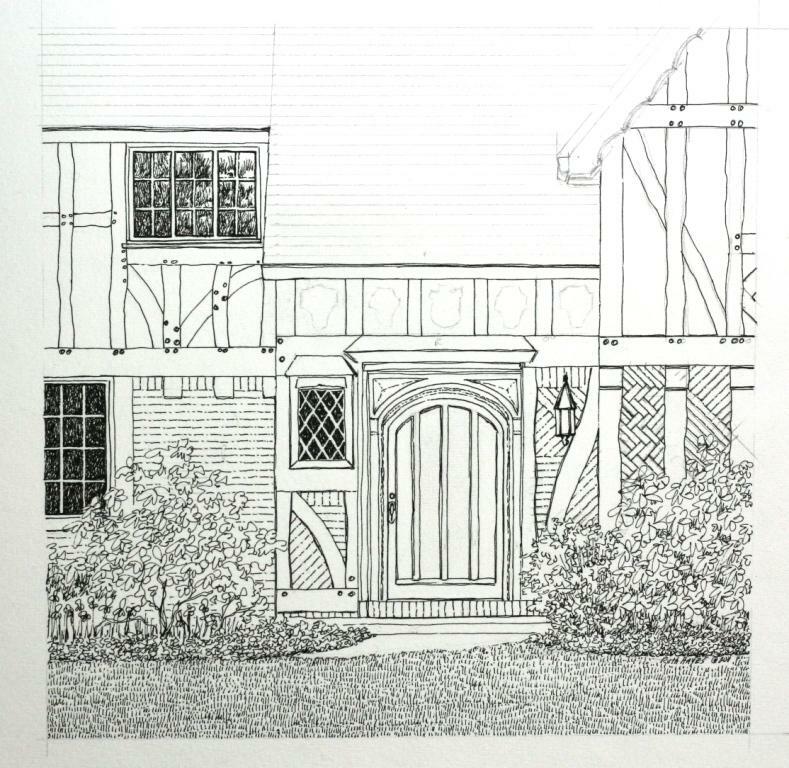 I have started the inking on the new entryway drawing this week and it is progressing slowly. It took a long time to lay out the crazily angled brick because my eyes kept getting lost in the patterns. Much of the other brick was fairly easy but that herringbone pattern really was getting my eyes crossed. I’m so glad there was only a small section of it. The bricklayer must have been feeling very creative on this house because he mixed and matched the patterns in a rather unconventional way all across the front of the house. In areas that I have cropped out, particularly on the right gable, the mixed patterns continue with no apparent rhyme or reason. I’d be interested to know if the homeowner was gone for those decisions or he knew and approved beforehand. This house also has a ripple in the rake trim board that I haven’t seen elsewhere. The eave is offset from the house and I wonder if the soffit is open. I can’t quite tell from the photos, but there is a shadow indicating some depth of overhang in the front. I would love to see into the foyer. It would likely be quite lovely with that diamond glass window and the 4 foot wooden door. It would be interesting to see what kind of lighting was there also because with just that one little window and a solid door, I imagine it is quite dark. I often get curious as to what the foyers look like in these homes. I like to think that they are warm and inviting to all who enter. I have also been thinking about all those in the path of the hurricane this week. I hope the damage is minimized for all and everyone keeps themselves safe. I only wish we could have taken some of the rain from them. The drought continues here unabated and I think will start to have more serious effects on the wildlife and plants as time goes on. We are already going to have to cut down about a dozen dead trees around the house that succumbed to last year’s drought and the cold, cold winter. Also, the deer I have seen around the lake lately have very strange-looking coats. Some of them almost look albino compared to the normal reddish-brown. I haven’t seem Mr. Turtle lately even though it seemed earlier in the summer that he was living in the front flower beds. And the butterflies have virtually disappeared. The butterfly bush that hosted a dozen tiger swallowtails at one time last year, now only seems to feed a few of the more common ones. I’m dreaming of rain, but there is none in sight. It has probably been a month or so since I’ve done any architectural drawing, but I really felt I needed a break and spent the time trying some new things with watercolors. It was a great mental change of pace and a real chance to experiment. Of all of the paintings I did, I think I like the cone flowers and the apples/pepper ones the best. It was a lot of fun, but I think I’m ready to get back to the pen and ink and pastel work now. So I laid out the rest of the photos from Ohio earlier this week and picked out one that appealed to me. 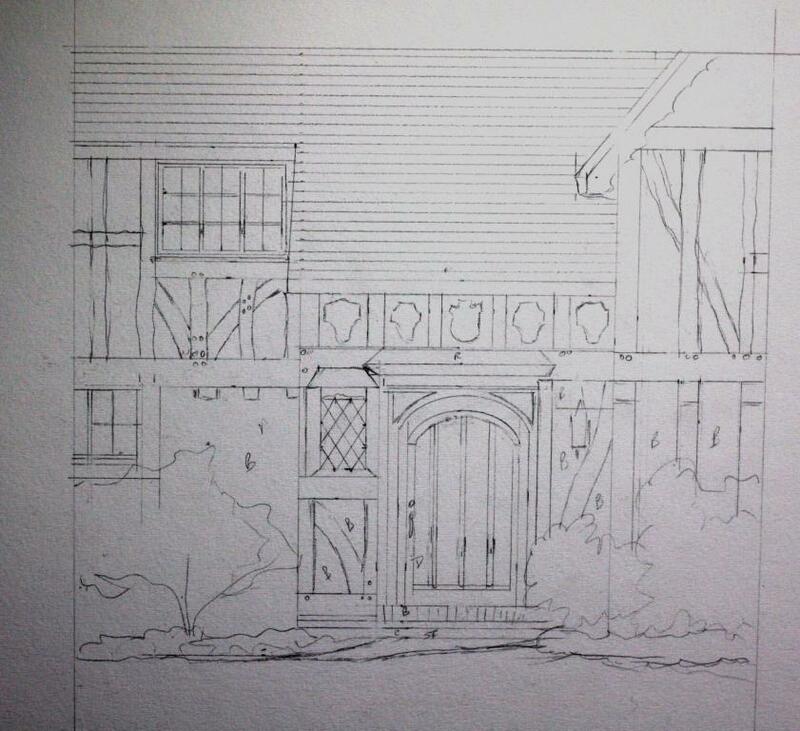 As you can see, I ended up choosing another Tudor home. It has a wonderful arch top wooden door and lots of interesting glass. You can’t tell from the pencil drawing but the brickwork has the crazy angles to it also. Someone had a lot of fun bricking in between the exterior timber work (or else was ready to tear their hair out). Personally, I’m betting it was an interesting way to break up the monotony of the normal rows of brick. The landscaping was a little thin, so I will add some more plants and colors. It was early spring when I took the pictures and I can’t believe that there would not be flowers. I really like all of the curved bracing in this one. It adds so much architectural character compared to a house with only straight timber work. The stone shields above the entryway are rather interesting too. There are 3 distinct patterns. I don’t know what they signify, but I like the variations. I’m still looking for information on a good, reasonably priced home/office printer so I can make my own art prints, so if anyone can give me some hints, I’d appreciate it. I managed to get out earlier this week and buy the green pepper for my next painting. Actually I bought two – one to put in my artichoke pasta salad (yum) and one to paint. 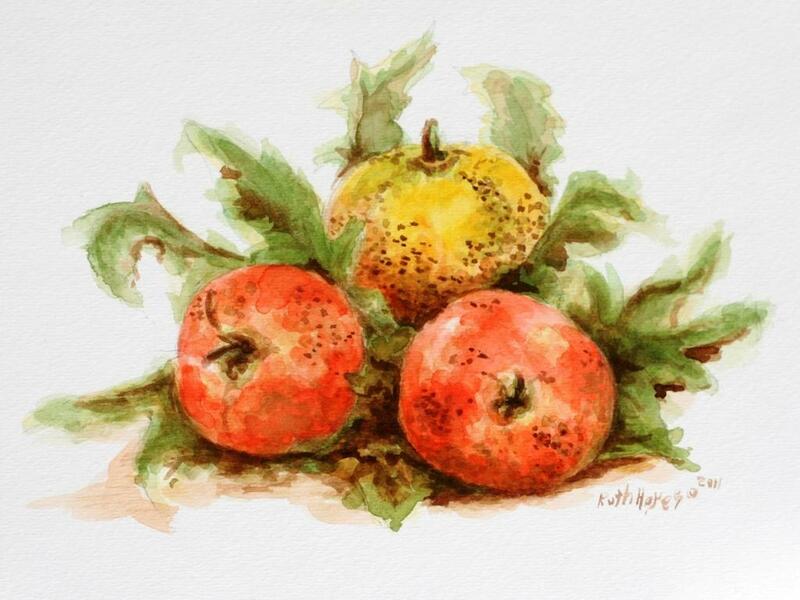 I still had the small, wonderfully knobby green apples that I picked from the old trees up on the hill and some potatoes from my sister’s garden. 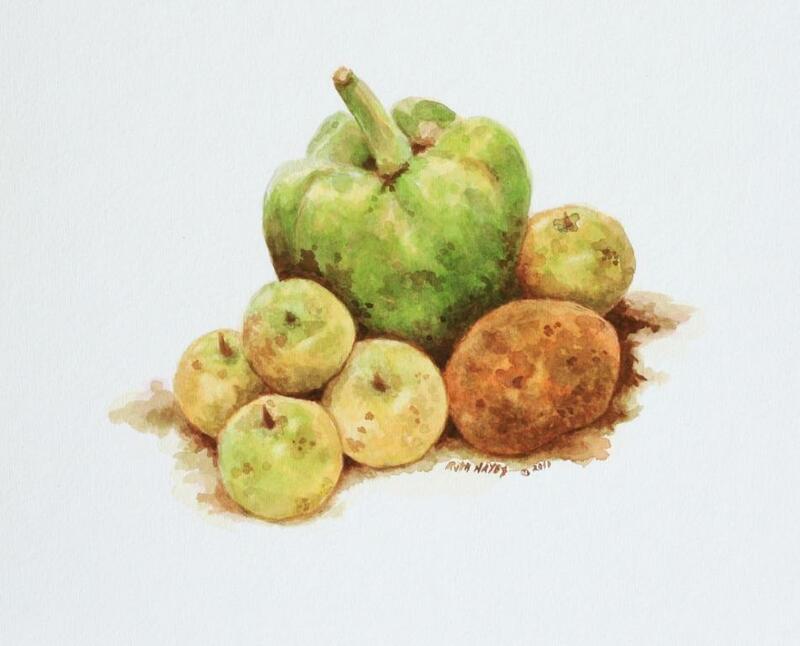 I tried the pepper and apples alone at first, but the composition and colors wouldn’t work out for me so I decided to add the potato. It seemed much better then. I worked on the painting over the course of several days, a little bit at a time. For some reason I had to let it set more often so I could “see” it again. Maybe it was all of the greens involved starting to run together, but I felt I needed frequent breaks. All in all, I am probably the most pleased with this watercolor. I don’t know exactly why, but I like the colors and brush strokes of this one more than any of the others. I finally had to stop when I felt that I was getting to the stage of adding a little here and a little there and suddenly it would become a little too much. I think I’m about ready to go back to the architecturals now, feeling quite refreshed from all of the watercolor work. I’m also thinking of making some prints of my work to sell. Does anyone have advice on a good home printer that doesn’t cost an arm and a leg to buy and use? It is so expensive to print commercially, even on line, and I would really like to be able to offer some prints in my etsy store. The white peonies are not the only things I was able to get from my grandmother’s flower beds right before her house was sold. She also had daffodils, some trace of which must have been still visible when we took the peonies. When we dug up a few of her daffodils, a pleasant surprise was unknowingly included. It actually took me over two years to realize what had happened when we transplanted the bulbs. Naked ladies (aka amaryllis belladonna) are so called because the foliage is only out for a few weeks in the spring, the same time as daffodils. Then, some 4 months later, long past the demise of the reedy thin, daffodil-like leaves, the flower stem suddenly bursts out of the ground and in the space of only a few days, blooms with a proliferation of flowers from a main stalk. The stress of a move or replanting will often cause them to skip a blooming cycle even though the foliage has appeared. It is sometimes hard to tell the difference between the leaves of the ladies and the daffodils unless you are looking for it and I most certainly didn’t notice them that first year. I thought that the lack of daffodil blooms was just due to the move and hoped for better the next year. What a wonderful surprise I had the following summer when in August the bare stalks erupted from the earth and flowered profusely. As you might have guessed, my naked ladies have just started to bloom. With the die back of many of my black-eyed susans and cone flowers, I decided to cut a single stalk of flowers and a few branches from the Russian sage. 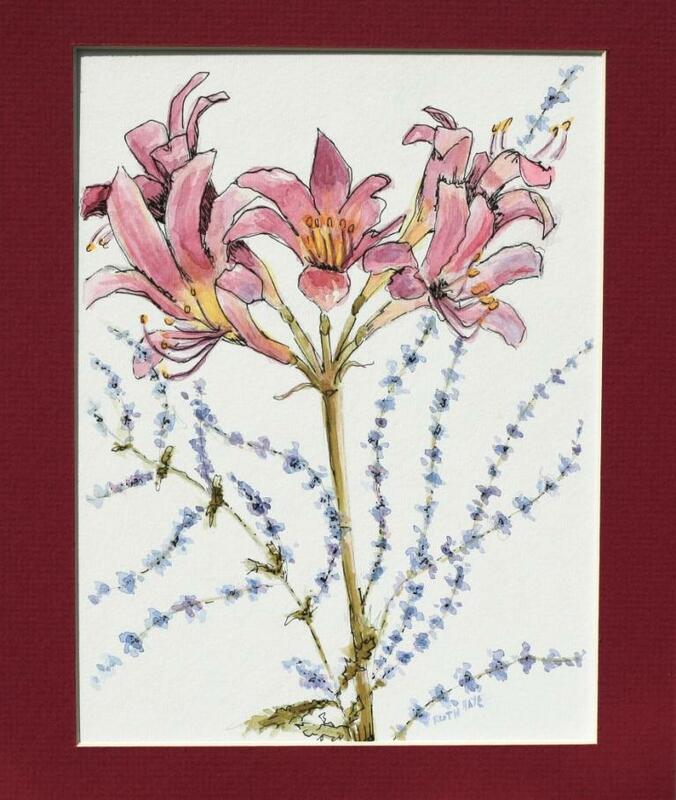 The sage has lovely small blue flowers coming off of each branch and I thought the combination of the delicate pink ladies and the blue sage might make a lovely arrangement.I painted the ladies first and then the sage. After two painting sessions, I could not get the pink flowers to separate themselves visually. I let it rest for a day and decided the only way to salvage the painting would be to delineate with the ink. I have been very good so far about not resorting to the ink when I get frustrated, but I kind of gave up with this one. I did not want to over saturate the soft pink color of the flowers and felt that a little bit of ink accents would help the painting as a whole. I also put it in a mauve mat to see what it did to the color. These flowers were one of Grandma’s favorites and she certainly called them the naked ladies with some risqué glee. For the longest time, I never knew they had any other name. As with the peonies, I have half a dozen groupings now that I am sharing with family. I know Grandma would be pleased. This week I picked a few small apples from an old tree up on the hill top and bought a green pepper. After I try painting them I think I’ll be refreshed enough to go back to the architectural work. We finally got a little break in the weather this week. The string of 90+ days has ended at least for a while and it is actually supposed to drop into the 50’s tonight. Maybe it’s time to open the windows and air out the house this evening. I spent some time this week out in the flowerbeds weeding because of the cooler weather. The flowers are starting fade somewhat so I decided to move into the vegetable camp for this painting. I picked a few of my red and yellow tomatoes as a start. Unlike store-bought ones, they are wonderfully not perfect in color and shape. I set up three as a still life on the rolling shelves next to my drafting table. Then I was off to the refrigerator to see what I could add to make it more interesting. Unfortunately, like Mother Hubbard, the vegetable bin was bare. I really wanted a pepper but I didn’t have any from the store and my own plants haven’t been co-operating. (I’ve picked one very expensive pepper so far.) I played with this and that and couldn’t get satisfied so I decided to get a couple of tomato plant branches and use them. I painted this today in two sessions and had to quit because I was starting to feel like I was getting into overdone territory. Just a little something here and a little something there and suddenly you’ve crossed the line. I may want to change it a little bit above the right tomato. It seems to be an area of not enough value difference there to my eye but I’ll wait until tomorrow to look at it again. I may fool around with a few of the leaves but I think the tomatoes are done. And just so you know, the photo colors are waaaay better than the real thing. I’d be happy if it looked more like the photo. I plan to get back to the architecturals soon, but my brain needed a serious break and I’ve just been having fun. I tried to stay cool this week, but it hardly seemed possible if I went outside. Yesterday was the 22 consecutive day in a row of 90+ degrees. It is just hot, hot, hot out there. I keep missing the total number of days above 90 for the summer but it has to be getting up there. The dryness of the ground is unbelievable. Overly humid air that doesn’t rain and rock hard, cracking earth make it an uncomfortable time for every living thing. We got almost .3″ of rain Saturday night, but it seemed merely a drop in the bucket. By Sunday afternoon you would never have guessed we had gotten anything at all. 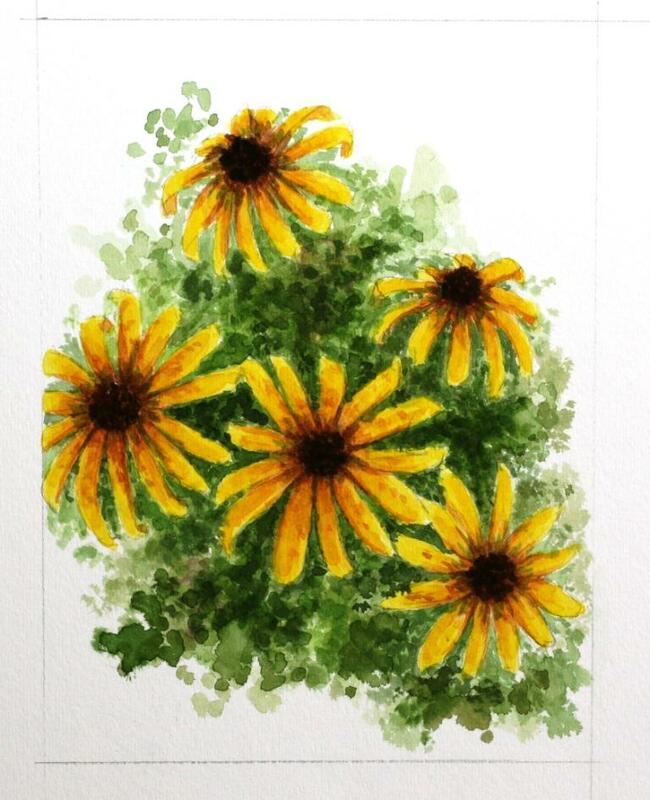 The heat and drought have taken a toll on my flowers, but I went out and picked what I could, including some black-eyed susans, petunias, and some more day lilies for live studies I decided to try the susans first so I could work at keeping the yellow values brighter. I first layered in cadmium yellow and then added the darker colors. Since I had to spend most of my painting time this week in the evening under my daylight fluorescents it was hard to get true color values. The photo is a little more vivid than the actual painting, but all in all it is a fair representation. At this point, I feel it is just okay. Perhaps I am getting a little bored with the flowers at this point and just need to move to something else right now. I will let it sit for a few days and then look at it again. 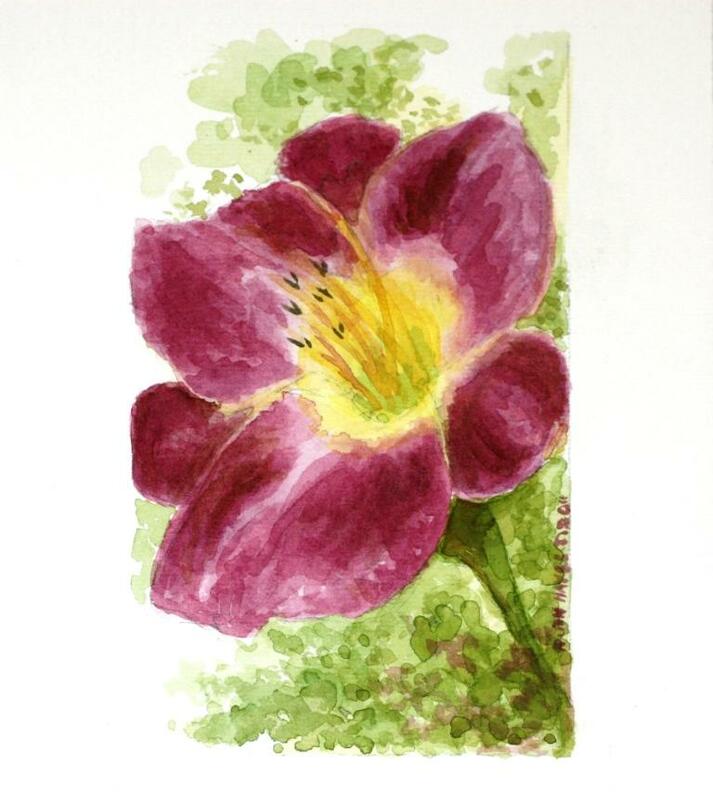 I also decided to revisit the last day lily painting. I had felt the overall balance was a little off with the greenery at the bottom so I went back and added a little more. I like it better now and will probably let it go at that. I picked a few of my fresh tomatoes and some small green apples from an old apple tree growing in the upper field yesterday, so I’ll probably do these this week as a change of pace.